The day began cloudy with occasional sleet at around 30 degrees. The sun came out off and on as the day wore on. The summit must have been around 20 deg, since the top of Muffin’s water started to freeze after only 15 minutes. At the bottom again, it had warmed up to about 40 degrees. The trails were snow-covered, from around an inch or two at the bottom, to close to a foot on the summit. 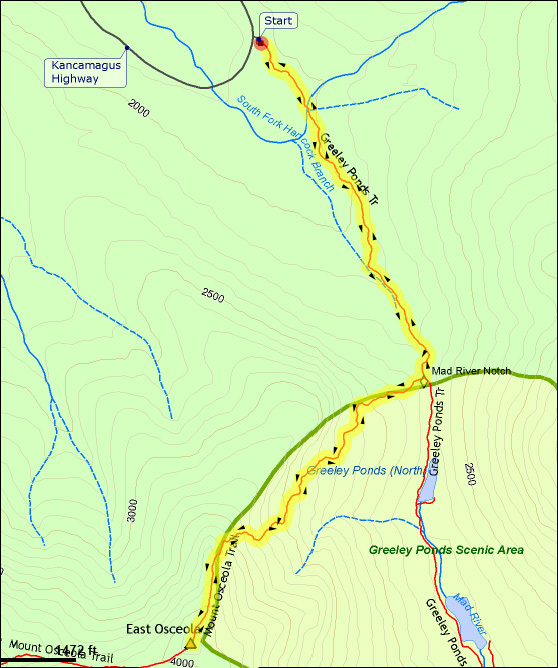 I parked the car at the Greeley Ponds trailhead on the Kancamagus Highway and we started up the trail around 8:00 AM. The Greeley Ponds Trail was relatively flat, but rocky and root-covered under the snow. There were lots of tracks. Someone had passed by earlier, probably the day before. There were also rabbit tracks, moose tracks, and some tracks that may have been a coyote or a fox. There were a few small stream crossings on the trail, and many timber puncheons on top of muddy spots. In one spot, I accidentally stepped onto what I though was a solid patch of ice, but ended up sinking up to my ankles in mud. After about 45 minutes, we reached the Mt Osceola Trail junction and stopped for a snack. Muffin on the Greeley Ponds Trail. 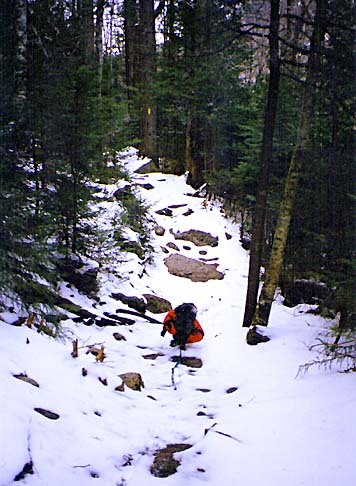 The trail was relatively flat, but rocky and root-covered under an inch or two of snow. Tracks on the Greeley Ponds Trail. There were lots of moose and rabbit tracks, and also some tracks that may have been a coyote or a fox. Mt Osceola Trail Junction. From here, the Greeley Ponds Trail continues on to the ponds and to Waterville Valley. The Mt Osceola Trail, which we took, climbs steeply up to the Osceolas.